The Indianapolis Colts today announced that restricted free agent cornerback Cassius Vaughn has signed his qualifying offer. 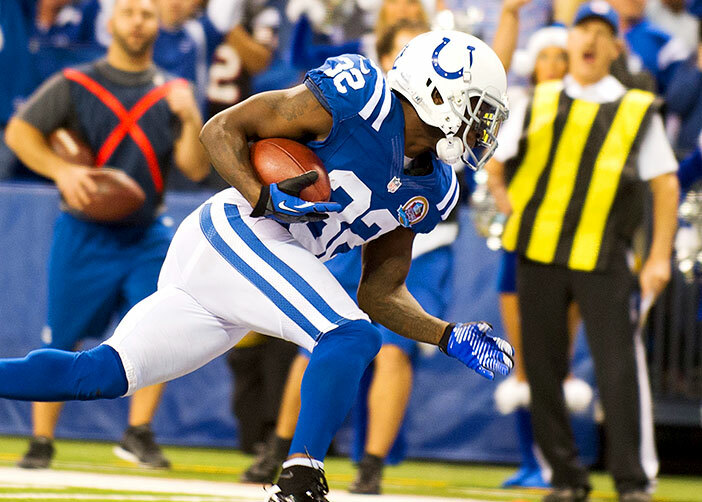 Vaughn was originally acquired by the Colts in a trade with the Denver Broncos on May 23, 2012. In 16 games (11 starts) last season, he recorded career highs in tackles (70), passes defensed (nine) and fumble recoveries (two) while notching his second career interception return for a touchdown. He also returned 10 kickoffs for 209 yards. In Week 14 against Tennessee, Vaughn earned AFC Defensive Player of the Week honors for the first time in his career after recording eight solo tackles, three passes defensed and a three-yard interception return for a touchdown in the third quarter to give the Colts a 21-20 lead. For his career, Vaughn has played in 38 games (14 starts), totaling 92 tackles (78 solo), 13 passes defensed, three fumble recoveries and two interceptions returned for touchdowns. On special teams, he has returned 19 kickoffs for 544 yards, including a 97-yard touchdown. This will be the best year for CMV this year!